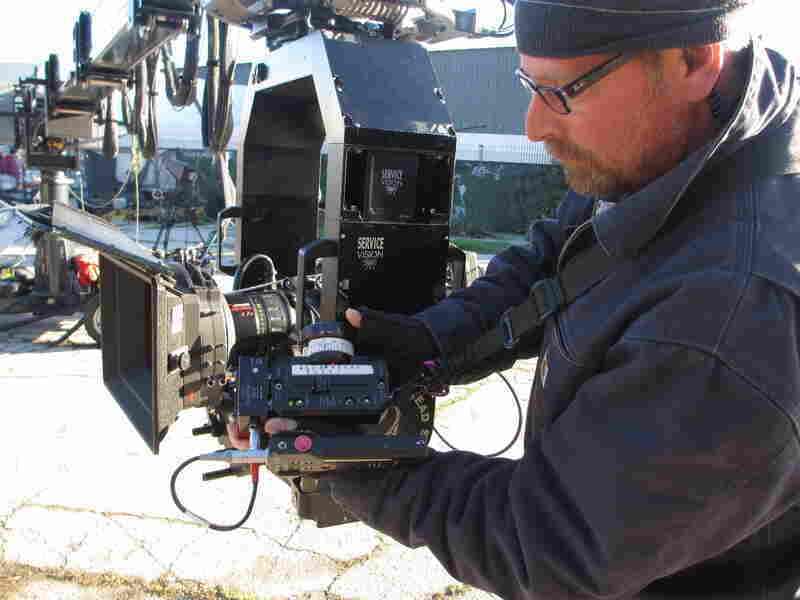 Hollywood Jobs: The Focus Puller - Sharp Eyes, Uncanny Instincts Keep Films In Focus Believe it or not, the person responsible for keeping each and every shot of a movie in focus never looks through a camera lens. NPR's Susan Stamberg explains the role of the focus puller. You won't believe it — I didn't — but the person responsible for keeping each and every shot of a movie in focus never looks through a camera lens. "No," says focus puller Baird Steptoe. "We do not look through the camera at all." Steptoe has worked as a first assistant cameraman on films from The Sixth Sense to Thor to last year's Grownups Two. He says he's learned to judge distances — precise distances — with his naked eye alone. "I mean, I can tell you roughly from you to me right now," he says. "I would say about 2-11." Two feet 11 inches, that is. Not that I brought along a tape measure for corroboration. But Steptoe has an eye you don't mess around with. On a movie, if he's wrong, he could lose his job. Turns out focus pullers don't look through the lens because the camera operators do that — they're busy framing the shot, panning and tilting, and they don't have a spare hand to focus in and out. So in Hollywood, where everything takes a village, pulling focus has become a separate operation, a job all to itself. Larry Nielsen, the first assistant cameraman on the set of the romantic comedy Walk of Shame, has movies in the eye and the blood. He's a third-generation filmmaker; his grandfather and father were cameramen and animators. Nielsen's remote device controls focus, zoom and aperture on the camera; a white wheel is marked with numbers that indicate distance. Nielsen assesses the distance between camera and actor, and he needs to be precise: If he sets the wheel to 9 1/2 feet, but the distance is actually only 9 feet 3 inches, the shot will be out of focus. Bundled against the early-morning chill, Nielsen wears a knitted cap, a warm coat and fingerless gloves. With his bare fingers, he'll adjust focus on a wireless remote he's using for this scene — wireless, because he can't be right next to the camera as he usually is, controlling the focus knobs. Today the RED EPIC camera is mounted far from the ground, on a big hulking crane. Down below, Nielsen's remote has a wheel that is marked in feet; he moves the wheel based on what his eye says the distance is between camera and actor. He's got to be within inches for it to work — and the distances keep changing as the crane swings around to follow the main character, played by Elizabeth Banks. "The minute she turns, it's my job to bring the focus forward to her face so that the eye naturally sees what's in focus," Nielsen says. In the movie, Banks' character is on a wild journey; she needs to get to an audition for a network TV job, but her car's been towed. In the scene they're about to shoot, she's racing around, dirty, her hair a mess, when she finally spots her car. So Nielsen is busy thinking back and forth in inches and feet and zooms and aperture adjustments, to be sure the faraway camera tracks all her movements clearly. "She's starting at about 16 feet," he explains. "She's gonna walk towards the camera, and we're gonna catch her at about 9 feet, and the camera's gonna swoop around and get as close as about 5 1/2 feet. It's my job to make sure she's in focus, frame for frame, 24 frames a second." It's like a slow-motion mental exercise before the real thing begins. Once the director calls "action," there are only two people walking as the scene is being shot — Banks and focus puller Nielsen, coordinating the changing camera distances with his remote. Walk of Shame director Steven Brill says he's depends 100 percent on his first assistant cameraman to keep the scenes in focus. "If they are not sharp and in focus," he says, "the film isn't usable, and we cannot go forward." Even Director of Photography Jonathan Brown is in awe. "It's a mystical art," he says. An art Nielsen has clearly mastered. Not right away, of course. Nielsen began learning to focus with tape measures. After a while, his eye was trained and he didn't need the tapes anymore. Except, he says, in certain circumstances. "After a 14-hour, 16-hour day, I'll be pullin' my tape occasionally," he admits. He finds himself metaphorically pulling focus in everyday life sometimes — standing outside a movie theater, say, in a really long line. "Yeah, sometimes I'll say, 'We're about 25 feet and the line's ... taking 10 minutes per person, yeah." At age 48, after years in the business — he worked on Avatar, The Kingdom, Shutter Island and many more — Nielsen is pretty confident about his craft. It's one, he notes, that would have been harder in the old days, when they didn't have monitors on set to double-check what they'd shot. Years ago, filmmakers had to wait until the next day to see the dailies — and it could cost a lot of money if they had to re-shoot a blurry scene. Just imagine if the focus puller hadn't been on his game for Gloria Swanson's famous final scene in Sunset Boulevard — she might have been ready for her close-up, but it wouldn't have looked like much. Editor's Note: Like others in their line of work, Larry Nielsen and Miki Janicin are mourning the death Feb. 20 of Second Assistant Camerawoman Sarah Jones, who was struck by a train while working on the set of the Gregg Allman biopic Midnight Rider. Their union and many other in the film industry are campaigning to have her honored during the Academy Awards' 'In Memoriam' segment this Sunday.